Wednesday was my last chemo treatment. 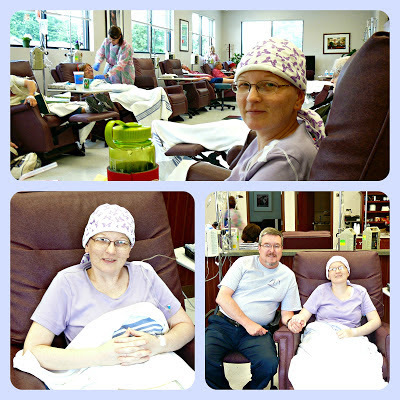 My husband and I spent 16 days at the cancer clinic over the past 6 months while I was getting my treatments. There are some things I will kind of miss about this place (such as meeting new people or spending the day with my husband), but I will NOT miss getting chemotherapy and the side effects it produces. I'm ready for that part of my life to be nothing but a memory. 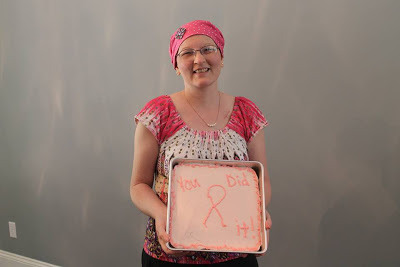 My Oncologist said the chemo reduced my chances of recurrence down to 20%. While I still don't like having ANY possible chance of recurrence, at least the 20% is better than it was without the chemo. If I remember right, he said there was almost a 100% chance of recurrence within two years if I didn't have the chemo. So, I'll take that 20%. In a couple of weeks, I will go back for a checkup to see if my blood cells are returning to normal. Then, if all is well, I will begin taking TAMOXIFEN. This is a medication I will take for the next 10 years to block the estrogen in my body, also helping to combat any recurrence. This medication will reduce my percentage down to a 10% recurrence, which is even better! In the meantime, I am waiting to get scheduled for the removal of this awful arm port. The nurses tried to access it again for this last treatment and were not able to get it through. Its time for it to come out. On Thursday, some of my friends got together and helped me celebrate the finish of chemo. It was a special celebration I will always have fond memories of. This was probably the longest 6 months of my life, but I finally made it to the finish line. The journey is not over, but I have at least finished this big part of the race. And, Lord willing, I won't ever have to run this race again. Thank you to EVERYONE who gave me encouragement and helped to cheer me on. Love this picture and your smile - a true inspiration and a woman of integrity, strength and most of all a true example of FAITH - The light of the Lord is shining through you! We are so glad for your strength in the Lord. What a joy to see a true believer take a journey as this and honor the Creator in it all.